“The News Sorority” by Sheila Weller….a commentary. As I skimmed the list of newly released books at the iStore, I was drawn to the cover of the book The News Sorority by Sheila Weller. 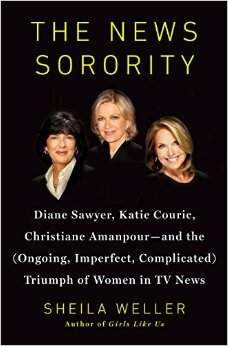 The subtitle of the book is “Diane Sawyer, Katie Couric, Christiane Amanpour-and the (Ongoing, Imperfect, Complicated) Triumph of Women in TV News”. I’ll be honest; I was hoping to learn more about Diane Sawyer and Katie Couric. Full disclosure, I do not watch the news and very little TV. I certainly did as a child/adolescent and young adult….but for a number of reasons (a distaste for conflict being one), I purposefully turned away from watching television news (and most television except sports and HGTV) in my thirties. I remain conversant with world, national, and local events, feel that I am a responsible citizen. But, I have long since become disillusioned by the drama and sound bites of what is currently presented on television. This is not a critique of The News Sorority….I did enjoy the book and if you like women’s history, writing, and journalism (as I suspect most of you do), then you’ll more than likely be able to critique this book much better than me. What I wanted to share was my awakening to the person who is Christiane Amanpour. I had certainly heard of her, seen her reports on CNN…but as is suggested in this book, her “international” reporting and “foreign” birth/heritage somehow made her less important than her colleagues, Diane and Katie, especially in the highly competitive world of American television news. The book is divided into sections, each featuring the three women alternately several times. I expected to skim through Christiane’s sections but found that the opposite was true….I skipped the others to read more about her life. And what a life it is! The review of her birth, upbringing, education, profession, international reporting, and “late marriage and motherhood” is the stuff produced by fiction novelists. In fact, if you were reading such a novel, you might think it too over the top! Who lives like that?! Well, Christiane does…..but of course, so do Diane and Katie. So, what drew me to Christiane? I think it is her willingness to go into the danger and speak for those who can’t speak for themselves…repeatedly. Certainly, many journalists do that (and danger does not need to be purely physical). But it is her relentless pursuit because it is the right thing to do that stands out to me. How courageous is that? Her reporting can be dramatic (bullets flying) or simply reporting as a witness to a wrong. She tells the story for those who cannot. There are many lessons, much courage, women’s rights, injustices, andmore in all three women’s stories….but for some reason this day, Christiane’s voice speaks to me above the others….she reminds me to be me. She reminds me that although my style is different than others, it is effective for me and that gives me an opportunity. In my professional life, I have the opportunity to speak for children who are affected by weight….and for their families. I have the chance to dispel some myths, offer some physiology, and show how bias, discrimination, and mockery affect my patients. It is hard. As a pediatric nurse, I am used to the public and colleagues praising my efforts to help children (valid or not). As a nurse taking care of children affected by obesity, I have experienced a “come-up-ance” as my husband would say….and have felt in a very minor way the daily abuse that confronts these children and their parents. It would be so easy to walk away….but they can’t so I try to carry on and help as I can. Christiane seems to find the strength to be a witness and write the story…and by doing that, provide inspiration to others to do the same. This entry was posted in Discussion by Nancy. Bookmark the permalink.